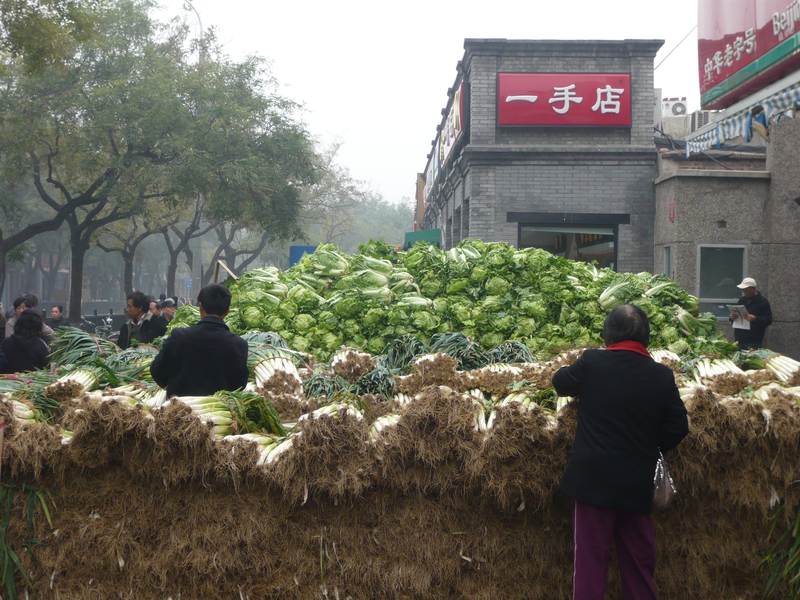 China is a place awash in complexities and paradoxes. It is a place that is growing, developing and modernizing at lightening speed yet at the same time is being held down by its ugly past. It is full of splendid culture and traditions dating back thousands of years. Yet, it also has some disturbing truths that may someday bring the current Communist Party and its “emperor” down. As the country continues to race towards become the next global leader and world power, the housing bubble is finally showing unwanted signs of crashing, the Communist Party is hammering down and trying to stop the rapid growth of micro-blogging, human rights activist, journalist and anyone speaking out against the government is imprisoned and severely punished, the environment is rapidly deteriorating, pollution is pitiful, and ghost towns lay dormant. All the same, China is still technically booming and its people are better off today than they were twenty years ago. China has witnessed one of mankind’s most incredible rise of its people out of poverty. Yet, where are they headed? What would happen if the economy begins to stagger or fall? Will people speak up and protest? Will there be a Chinese Spring? What will happen to the 900 million peasants who have seen their life improve but still have a long way to go? What will happen to the rest of the world if China is hurting? The implications are mind-boggling and of course would have worldwide effects. It is no coincidence that articles on current events in China are found daily in papers, online and on TV. China is huge, important and will impact us all. Perhaps these questions are why despite not “loving” traveling to China, I have found it one of the most fascinating places I’ve ever been. China is at the center stage of the world right now and to be there, witnessing it all, is an amazing travel experience. To wrap up my Beijing posts, I felt a photo blog on “Daily Life in Beijing” would help illustrate the complexities and paradoxes of this fascinating place. I am also including a list of intuitive articles on China today, for those who want to learn more. (See the bottom of the post for links). 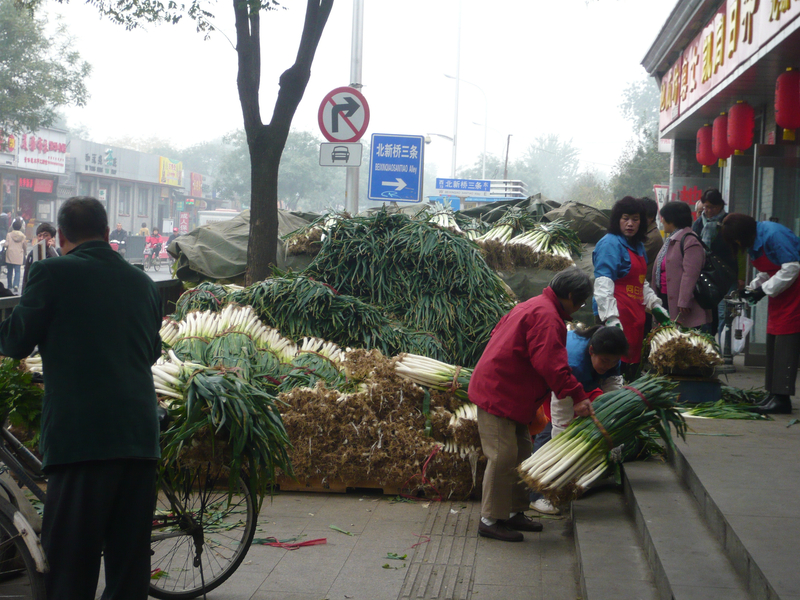 Here is a walk through Daily Life in Beijing. Hope you enjoy. 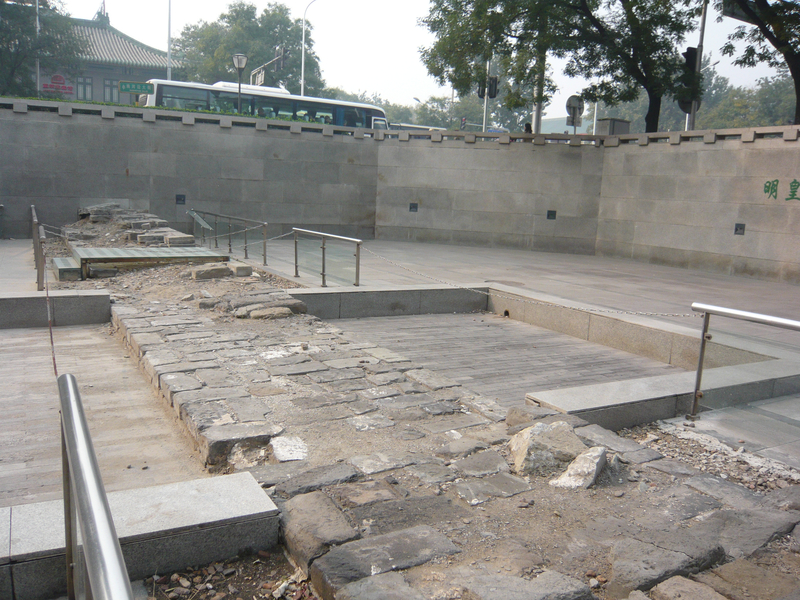 Old versus New: A remaining part of the ancient city wall in the heart of Beijing. All that remains is a dilapidated old wall. 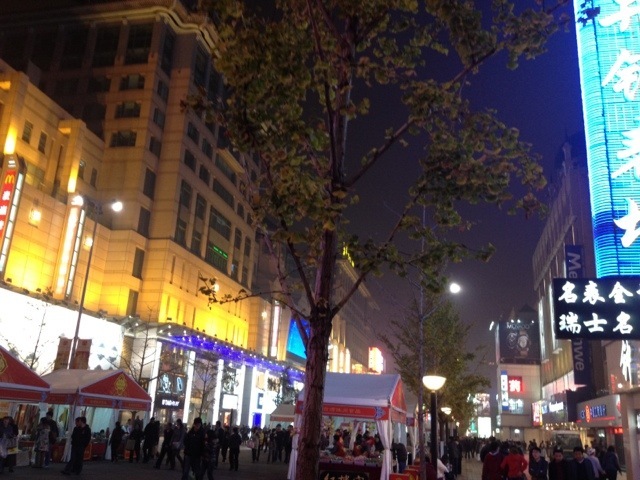 Whereas right down the street is Wangfujing Dajie (below), a Vegas meets New York City-styled pedestrian walking street and shopping Mecca. 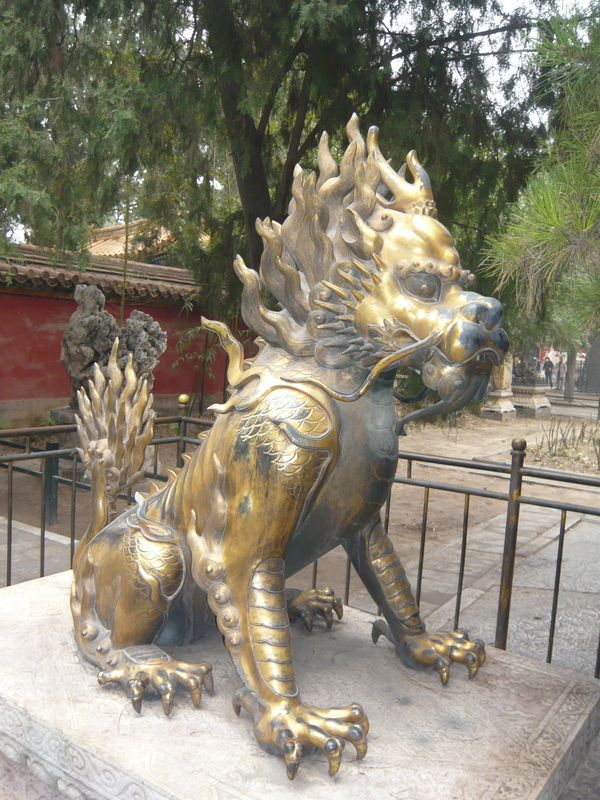 The Lion is the symbol of China and can be see throughout the country protecting its inhabitants for thousands of years. 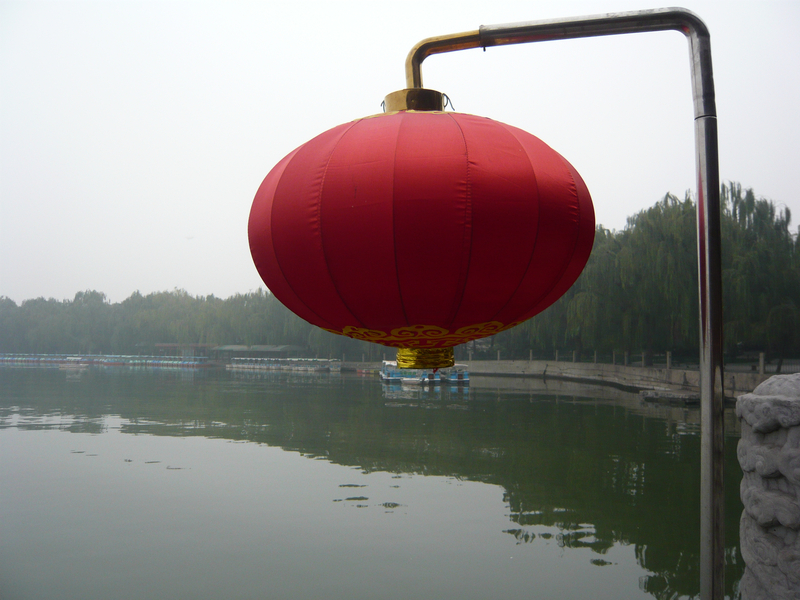 The red lantern, another prominent symbol in China. For some reason, I truly love this picture. 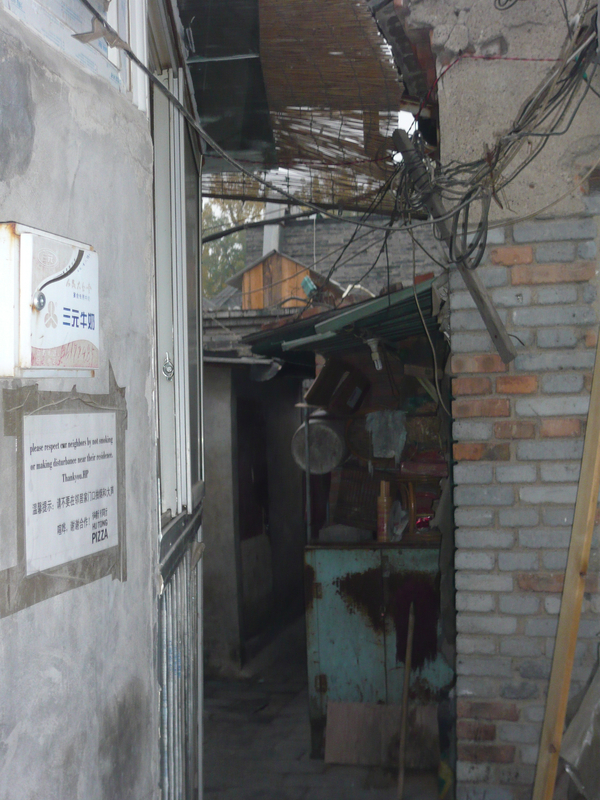 The Hutongs represent the old part of Beijing. 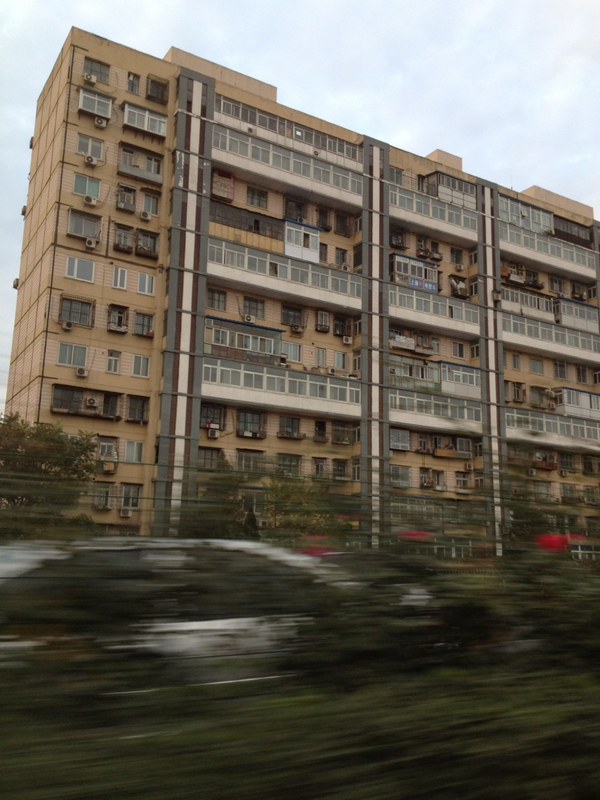 Hundreds exist yet many have been torn down in the thrust towards modernization. In a high-density city of over 20 million inhabitants, there are still many places like this one to find peace and solitude and enjoy nature. 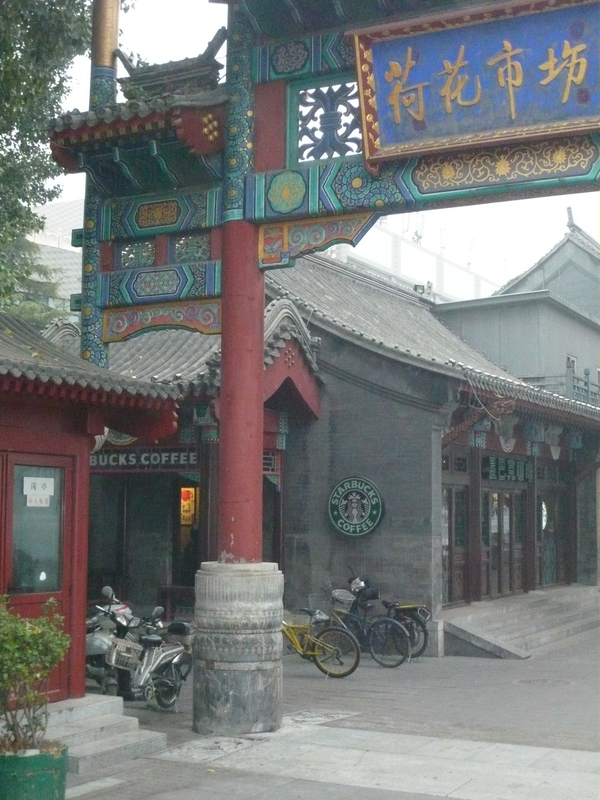 Signs of westernization and commercialism are prevalent but not overbearing like in most cities in Europe…note the Starbucks above. 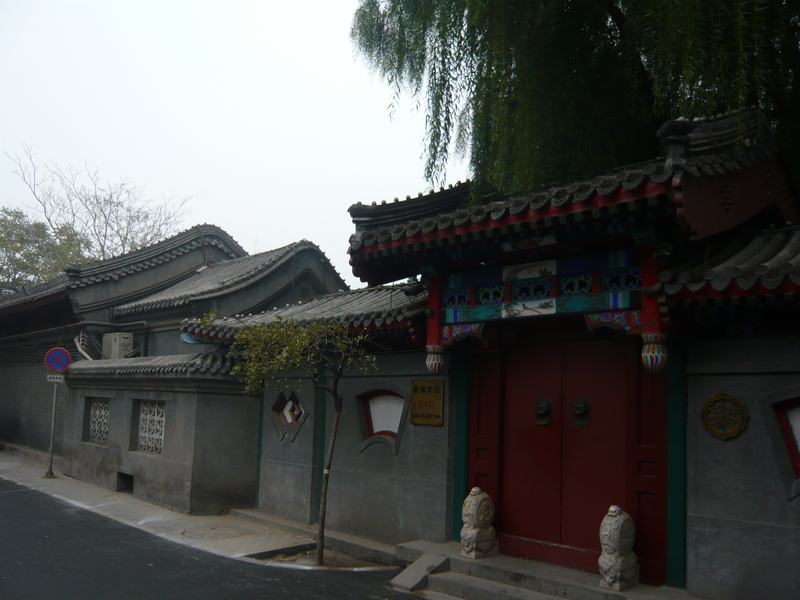 Yet traditional architecture can be found throughout the city bringing the visitor back to the days of the dynasties and reminding us of China’s long history and path. 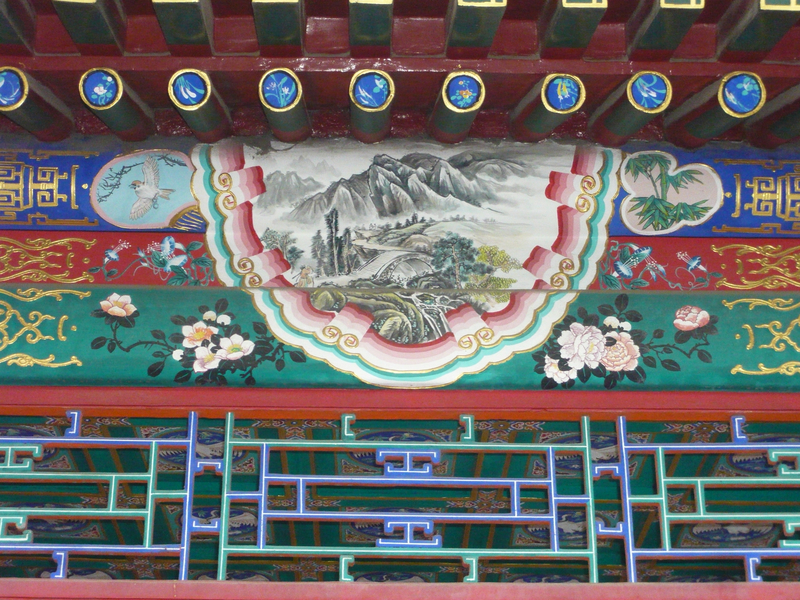 Truly spectacular hand-painted art embraces the heart and soul of Beijing. 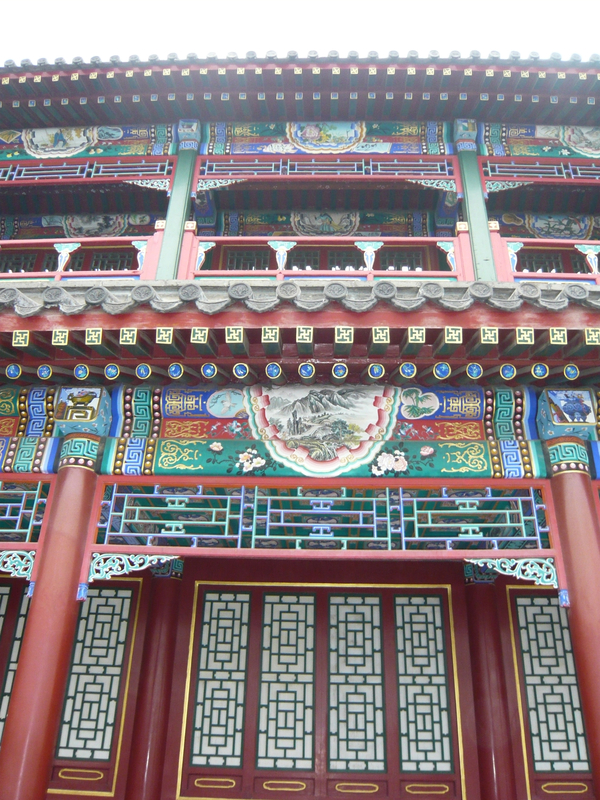 As you explore Beijing’s streets, you are struck by the contrasts between old and new. Modern and traditional. 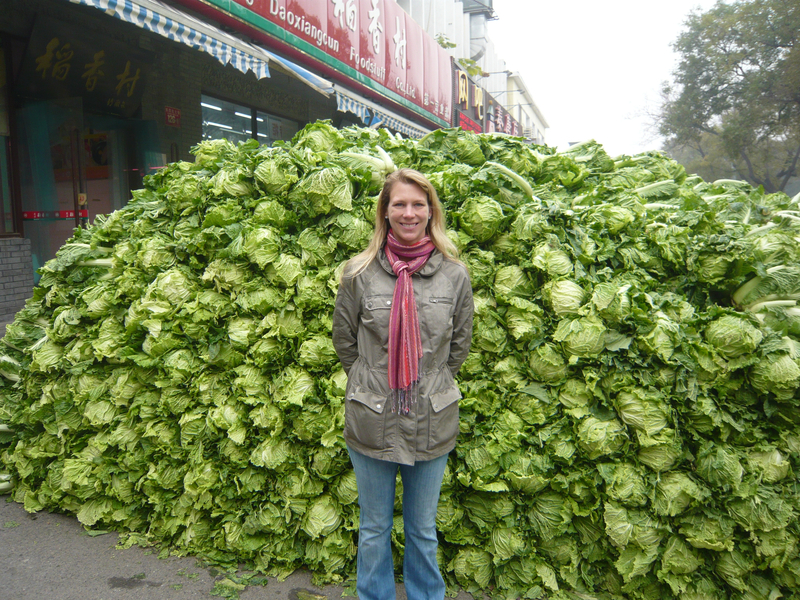 I found the local farmer’s markets to be one of those great contrasts and delights. Buyers and supplies loaded their produce onto the back of their bicycles, just like the old days. 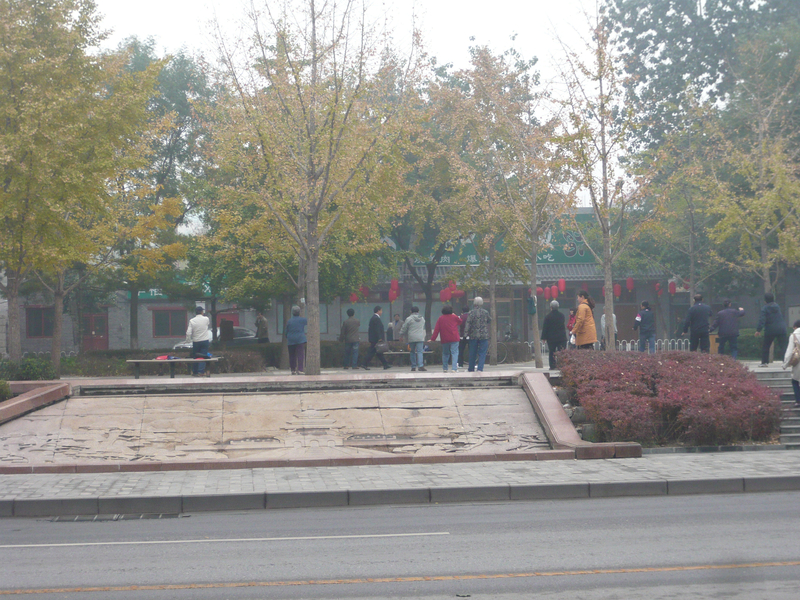 Tai Chi could be seen practiced daily along the streets of Beijing usually in the mornings. 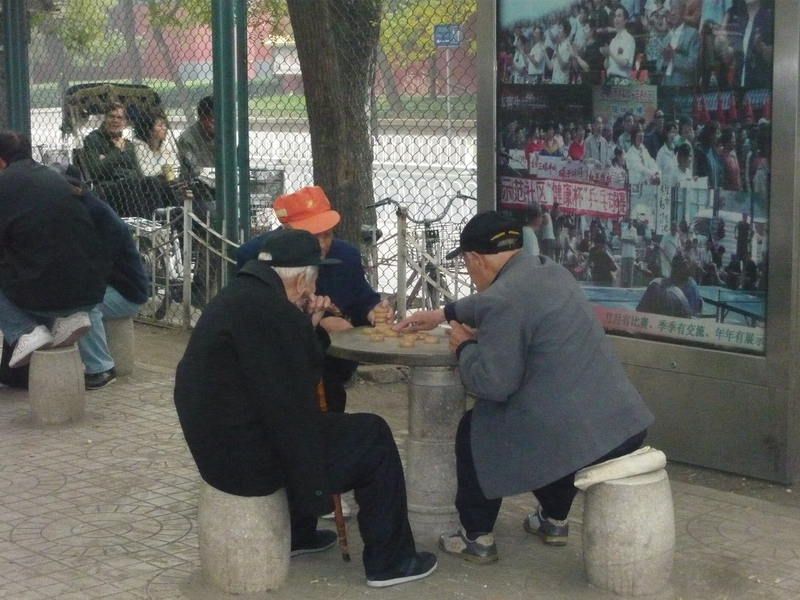 Or you could find parks filled with retired Chinese playing Chess, Checkers and cards. 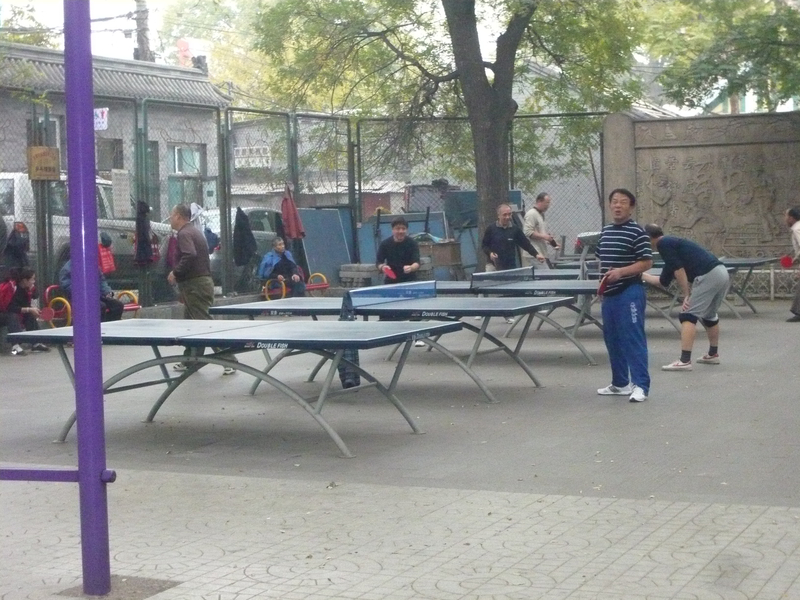 Ping-pong is also popular in Beijing’s many parks. Some of Beijing’s oldest Hutongs have been transformed into modern-day party central, filled with outdoor bars, terraces and craziness. 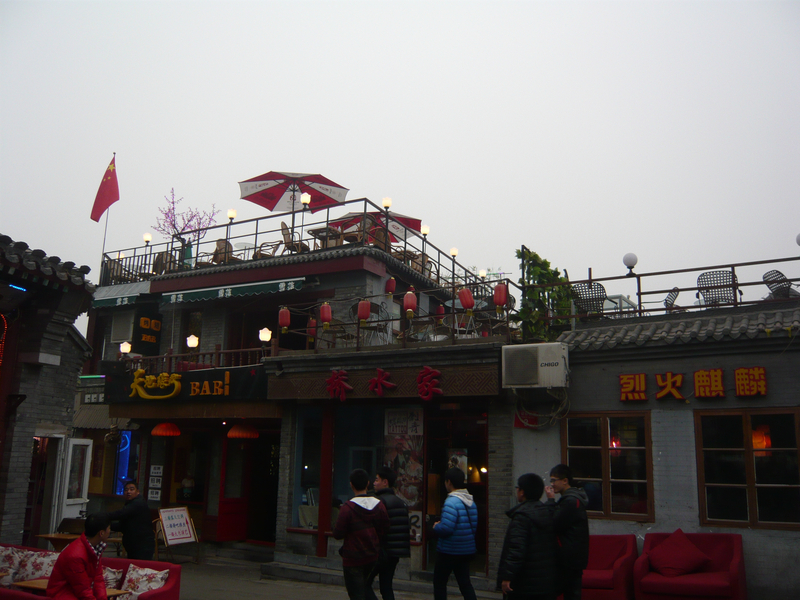 It was where all the young, somewhat rebellious Beijing youth hung out at night. 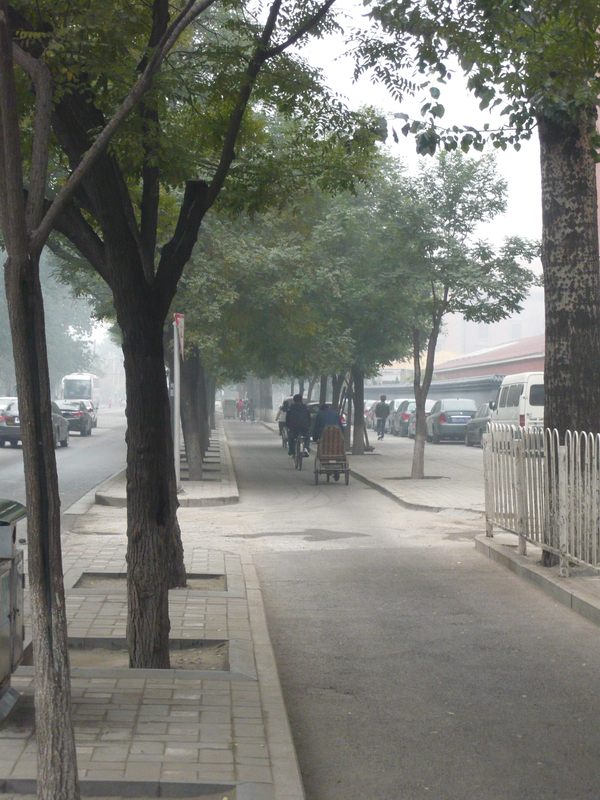 Beijing is still a large bicycling community. There are even pathways like these along the streets for bikes, motorbikes, motorcycles and electric bikes. 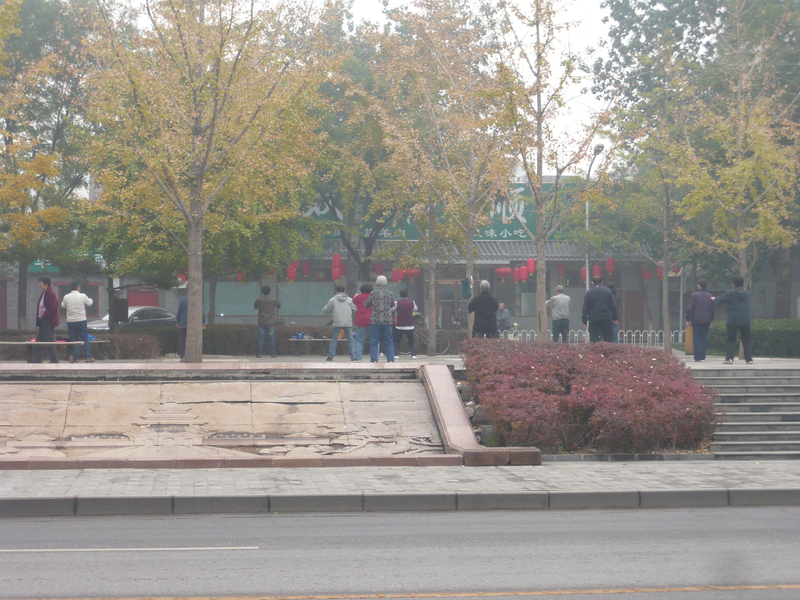 It is one of the main ways the Beijing people get around the city: On two wheels. 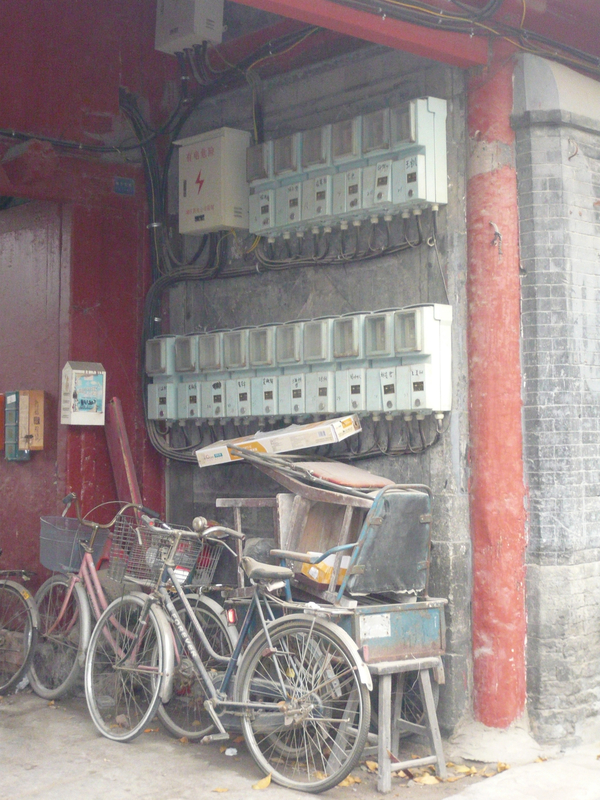 The electricity and bike park outside the Hutongs. 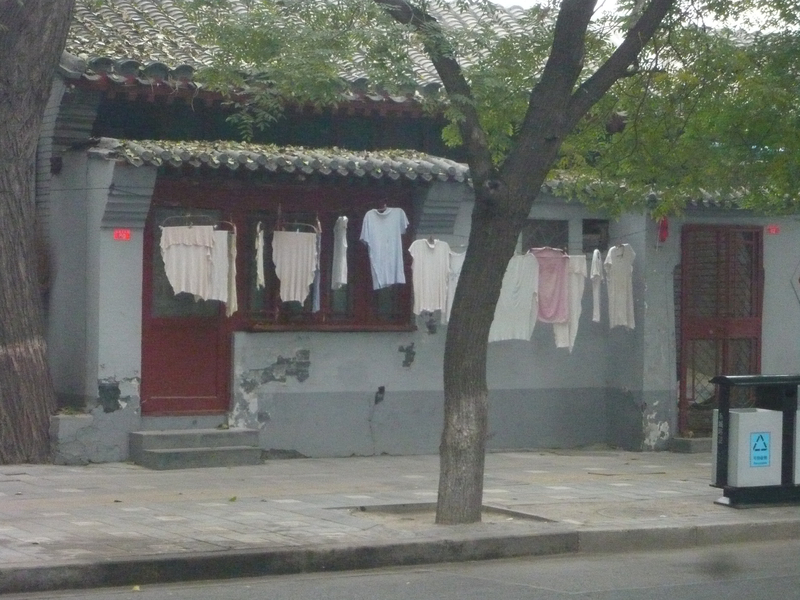 Laundry can often still be seen drying outside the home or apartment balcony. I was impressed with the creative methods for drying laundry in big cities! 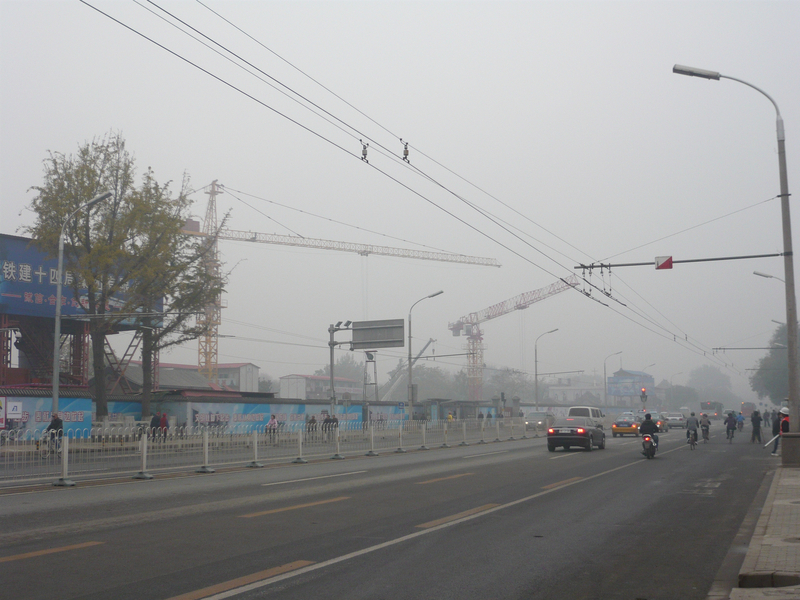 The pollution, congestion and traffic where alarming and frightening. 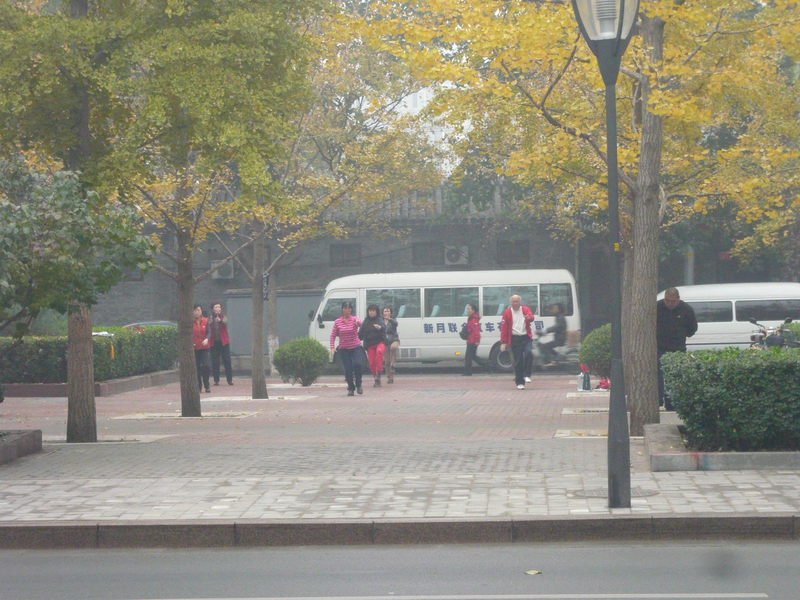 This is the typical day in Beijing. Gray, smoggy and dark. 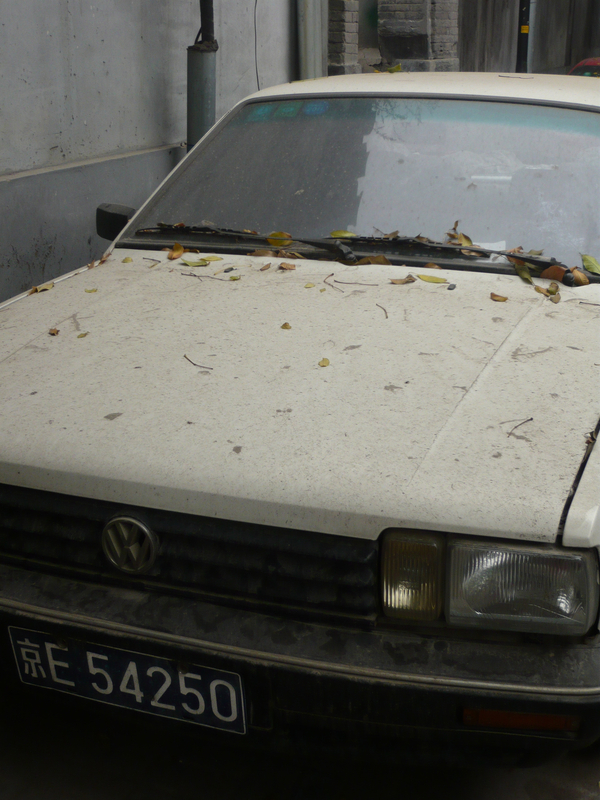 This parked car shows how dirty the air is! I had to take a picture of it. Not sure if it ever got or will get washed. 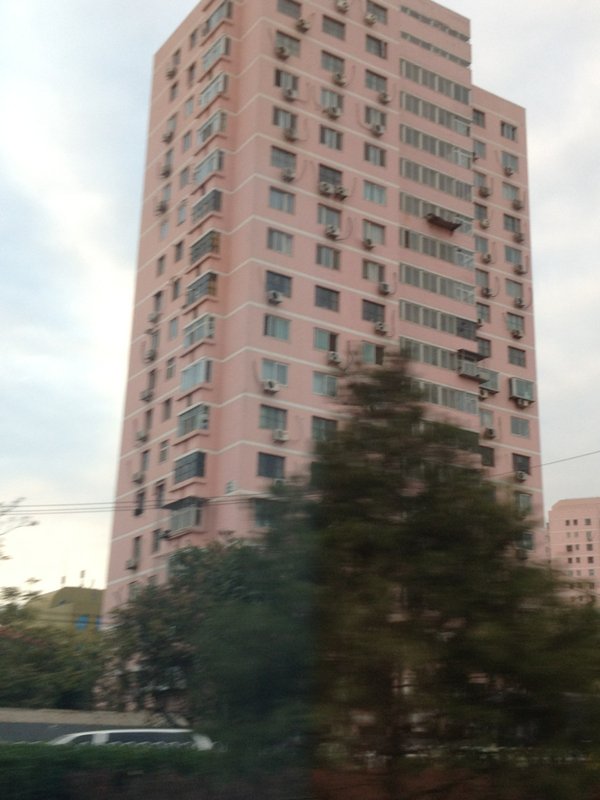 Most Chinese live in apartments. In a country of 1.3 billion people, space is key. 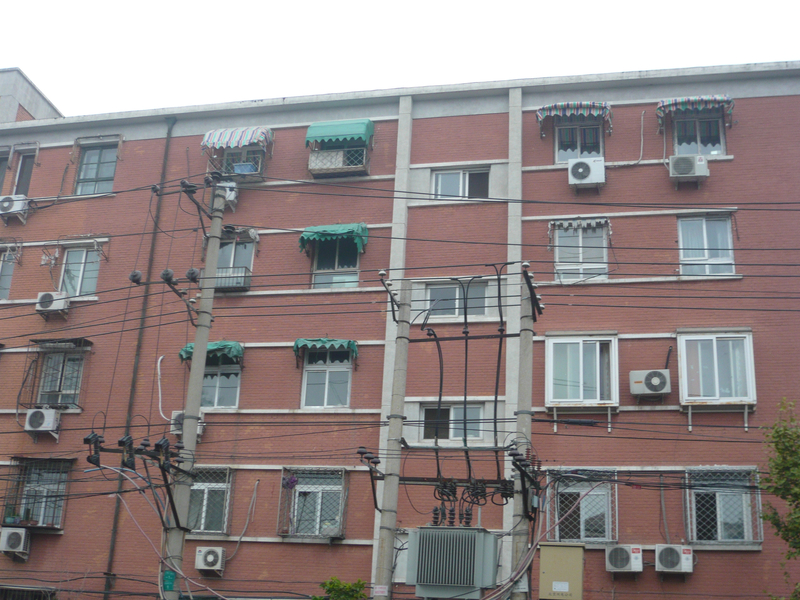 Most of the apartment complexes I saw in Beijing were quite dreary like this one below. 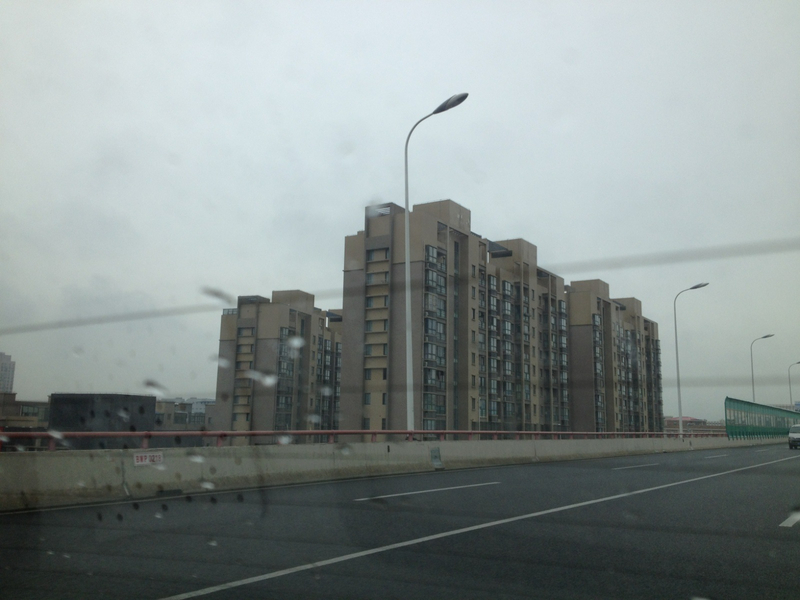 It reminded me of a Soviet-era complex. 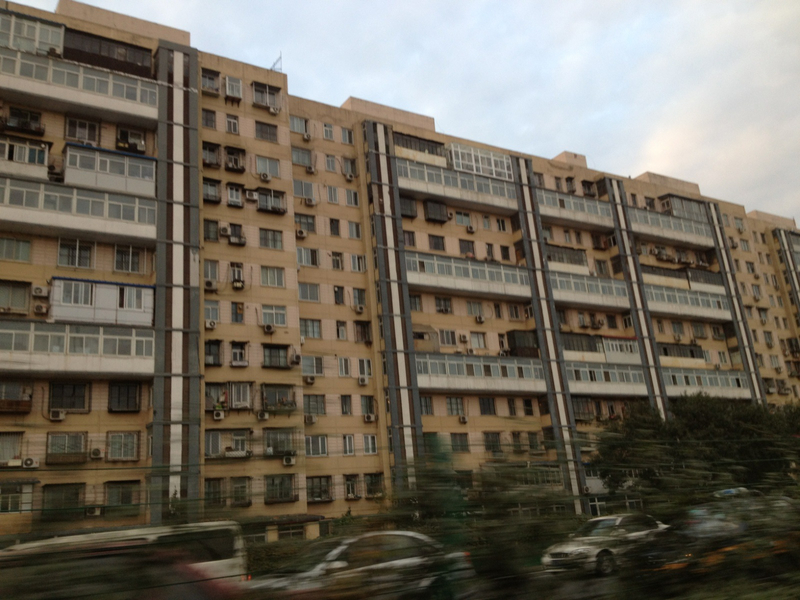 As you get out of the central part of town on the Ring Road, you pass a million of these kinds of apartment complexes where there are several generic-looking gray buildings clumped together as a some sort of compound. These kinds of developments are going up for miles and miles outside of the city. I have never seen so many apartment complexes being built anywhere. 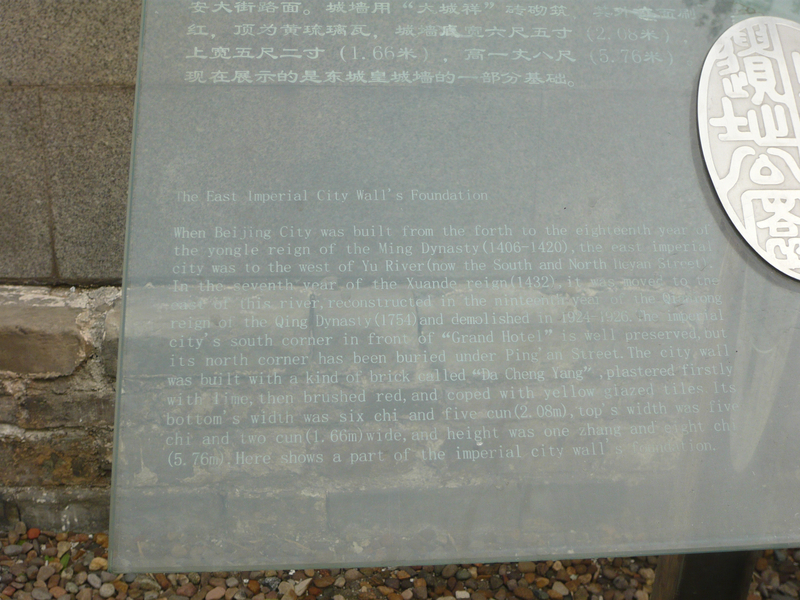 It simply blew me away and made me realize the gravity and magnitude of the Chinese ballooning population. 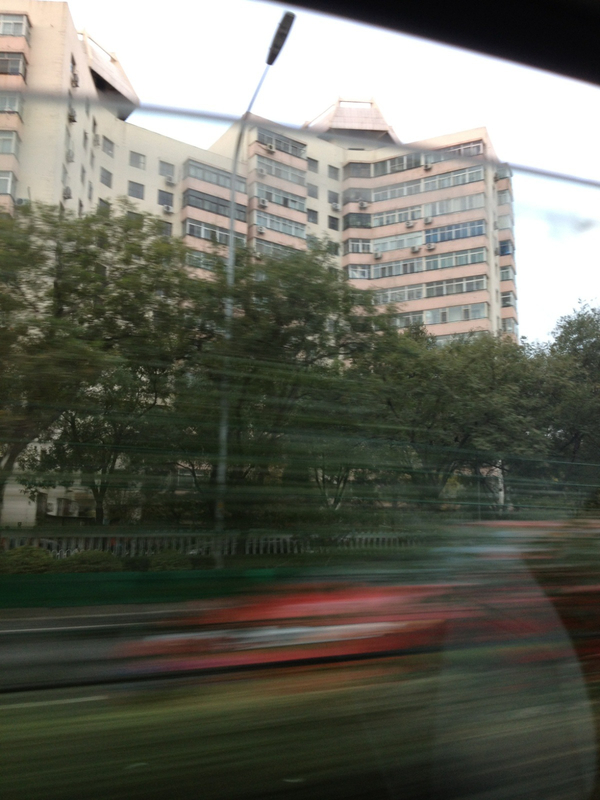 As our time dwindled in Beijing, I left feeling perplexed and uncertain about my feelings of this city. The history was amazing yet the complexities bothered me. I wonder what will become of Beijing and of China? How will it transform and grow into the next century? Will it hold on to its long traditions or will it become more westernized? Will democracy come or will the people remain powerless and voiceless in their own country. It certainly will be interesting to see. Also the tremendous book, “China Wakes: The Struggle for the Soul of a Rising Power“ by Nicolas Kristoff and Sheryl WuDunn is an excellent read. It is a little outdated by I think these two brilliant New York Times Writers are right on target with what is happening in China. I highly recommend this book to anyone who wants to learn more about China. Old China certainly looks more interesting than new China. I hope these people are going to fare well in the new country. I think some of them have a long way to go. I would not be happy living in that smog. I, too, love the lantern photo. Actually, I think it’s stunning. 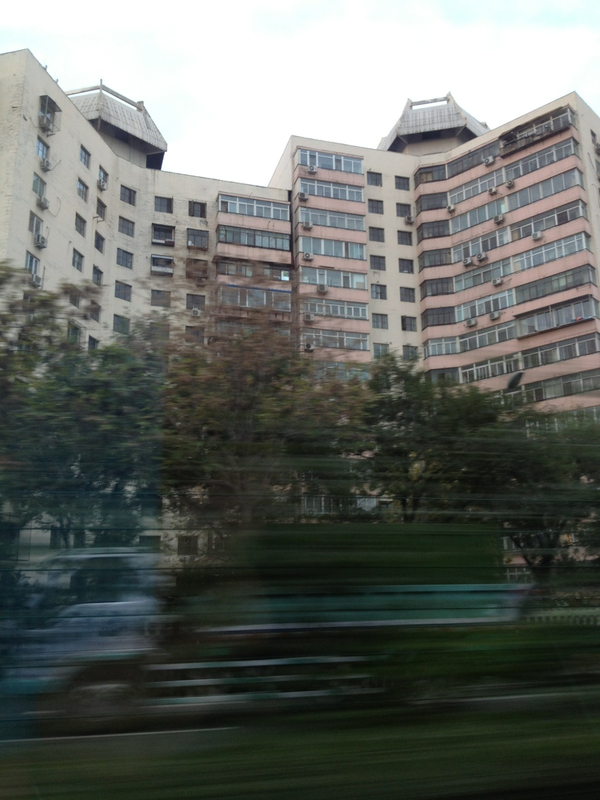 I also like the way you compare and contrast old and new China in these photos. Great post, Nicole. Happy holidays to you and your family! Thanks Kathy! I had way too many problems editing my photos on this post as well as the others. My dad says I put way too many in there! Oh well. I just found so many things interesting there. Happy Holidays for you too! We are off to spend Christmas with my entire family in Tucson, Arizona and leave Monday. It should be a nice break YET we still have no snow here in MN!!!! Glad you enjoyed the post! 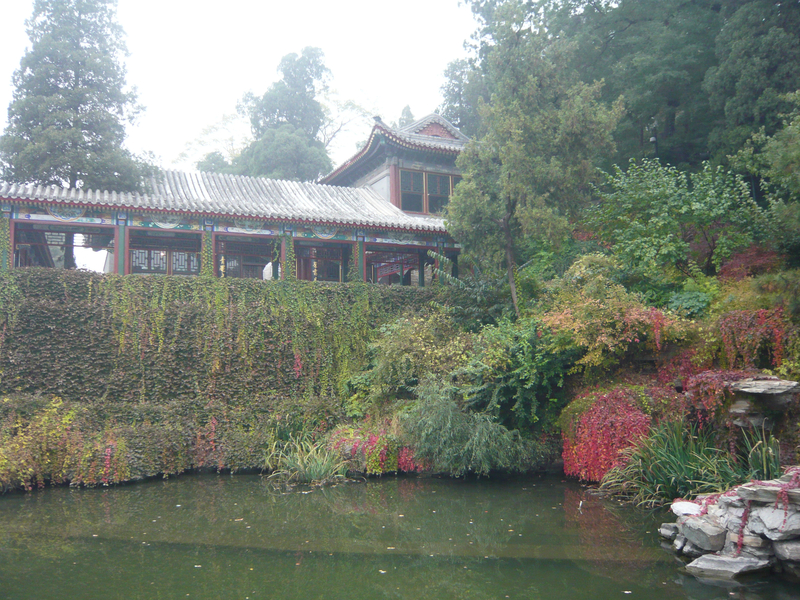 I really thought the Chinese people were wonderful and I enjoyed learning about their culture. It is truly a fascinating place. Yes, of course there are things that aren’t great but that is true everywhere. I try to see things with my eyes wide open whenever possible. Thanks for reading! 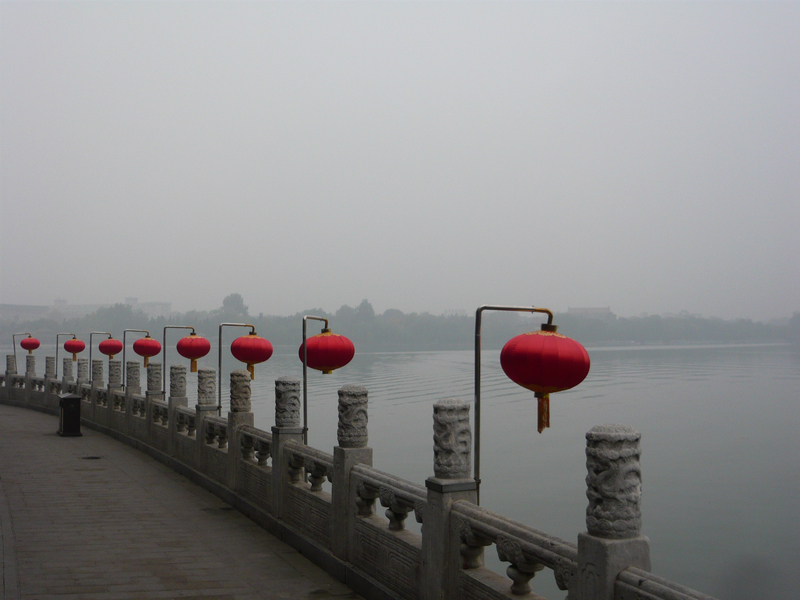 A really interesting post and especially love the photo of the lanterns leading to the horizon (very dramatic red against the grayness of the smog) and the electricity and bike park! Very good blog. 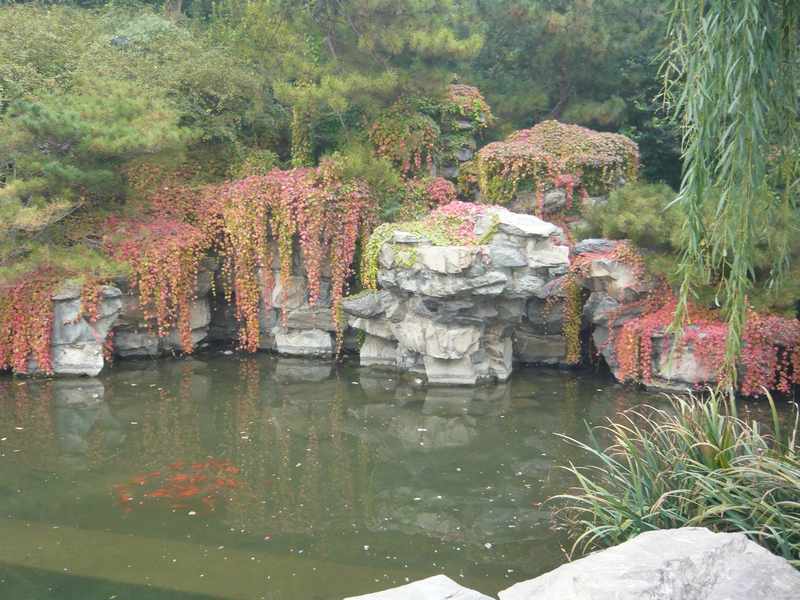 I was there in Oct. to visit my son who is in business in Beijing. 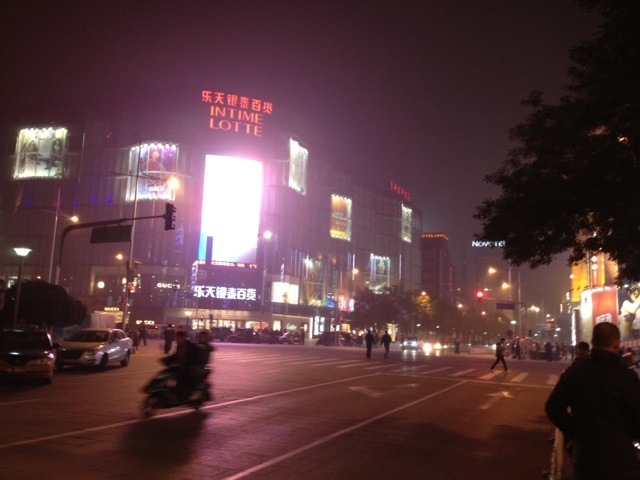 It was horribly-polluted but very exhitarating in terms of business, art, architecture, and intellectual discussion. Thanks for reading and your kind words. I appreciate it!